Jack Frost's cousin Mr. Deep Freeze hit the gardens Sunday night -- we had a low of 20F at Powell Gardens (22F in the city at the Kauffman Memorial Garden) that ended the season for many of our fall flowers. Pansies, Violas, ornamental cabbages and kale weathered that well and fruiting plants are just as beautiful as ever so there is still a lot of beauty to see in the gardens. Deciduous Hollies or Possumhaws (Ilex decidua) are now leafless but the female trees are simply ablaze with red holly berries. 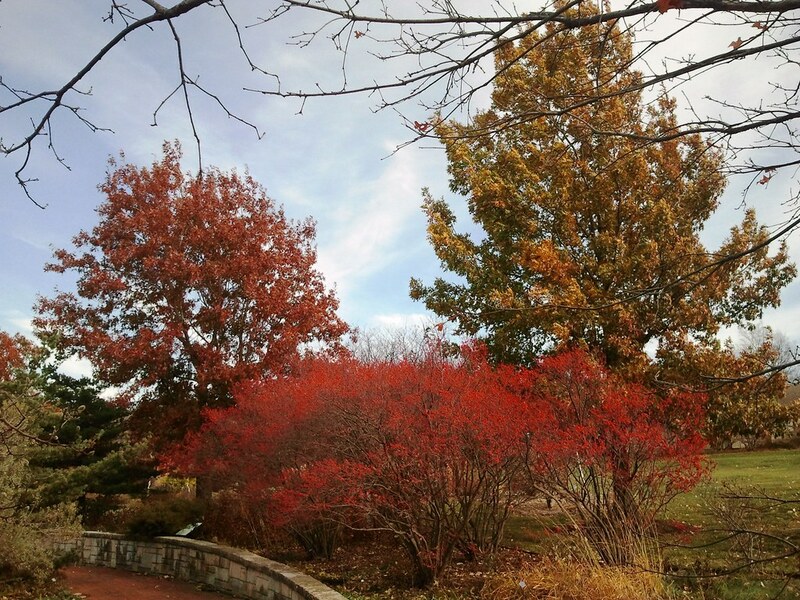 What a warming element to the late fall (and winter) landscape -- a wonderful display of these can be seen along the gatehouse landscape when you enter Powell Gardens. Flowering Crabapple varieties that produce fruit are simply stunning now too. This is the 'Donald Wyman' Crabapple in the Perennial Garden simply loaded with small red crabapples right now. Some would argue that these fruit are messy but the varieties we display at Powell Gardens hang on to their fruit until the birds eat them. There is minimal mess, an easy price to pay for such an ornamental display that lasts for weeks and even months depending on the weather. 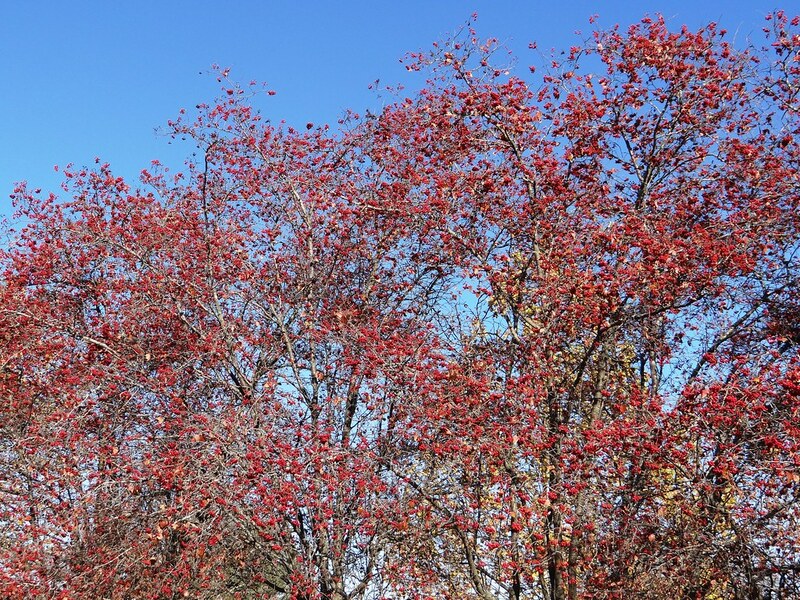 Donald Wyman Crabapple has fleeting red-budded, white flowers in spring but a much more spectacular display of red crabapples in fall and winter. Here's another view of the Donald Wyman Crabapple (right) showing its neighbor the 'American Masterpiece' Crabapple (left). There are several varieties of crabapples with more orange fruit like 'Amercan Masterpiece' which unfortunately is no longer available. 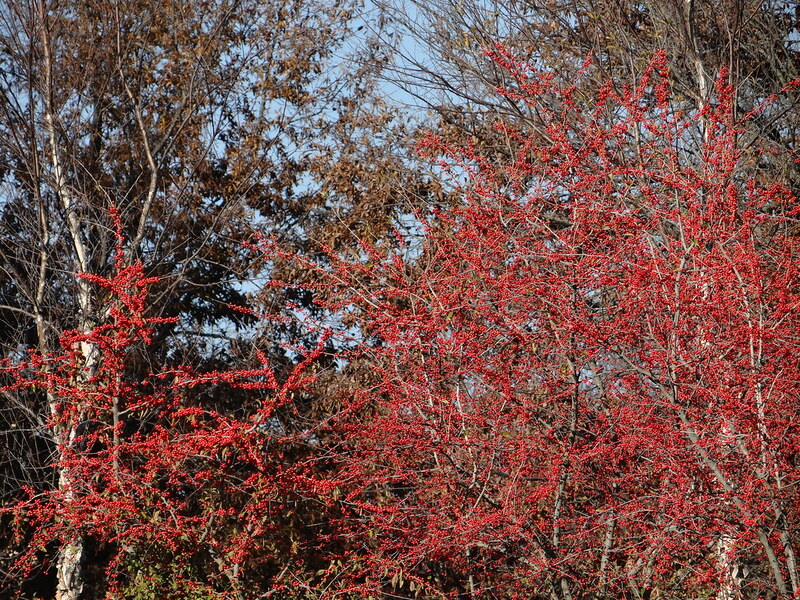 American Masterpiece has cranberry red flowers in spring and almost pumpkin orange little crabapples in fall and winter. Here are the orange crabapples of 'Indian Magic' Crabapple which is widely available. It's a smaller tree with purplish-red flowers in spring. Our tree of this is wedged between the much more vigorous Donald Wyman and American Masterpiece Crabapples in the prior image. 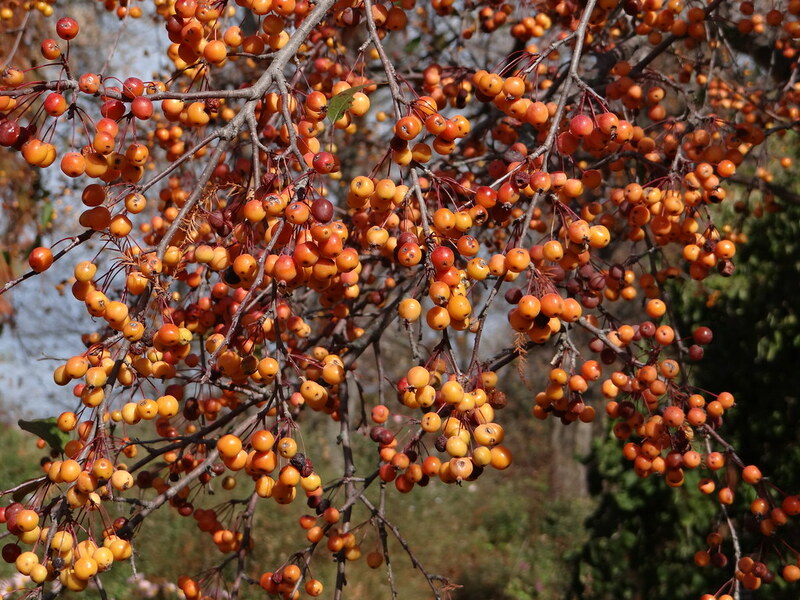 Tea Crabapples (Malus hupehensis) are bronzy orange now too, as they age you can see some are turning redder. These trees have a beautiful vase shape but grow quite large over time. Look for these at the west (Visitor Center) entrance to the Island Garden. Yes, crabapples come in yellow too! Here are 'Harvest Gold' crabapples which are such a warm yellow at this season. Their spring flowers are red-budded opening to white, fragrant flowers. Night lighting is reflected beautifully from these too. 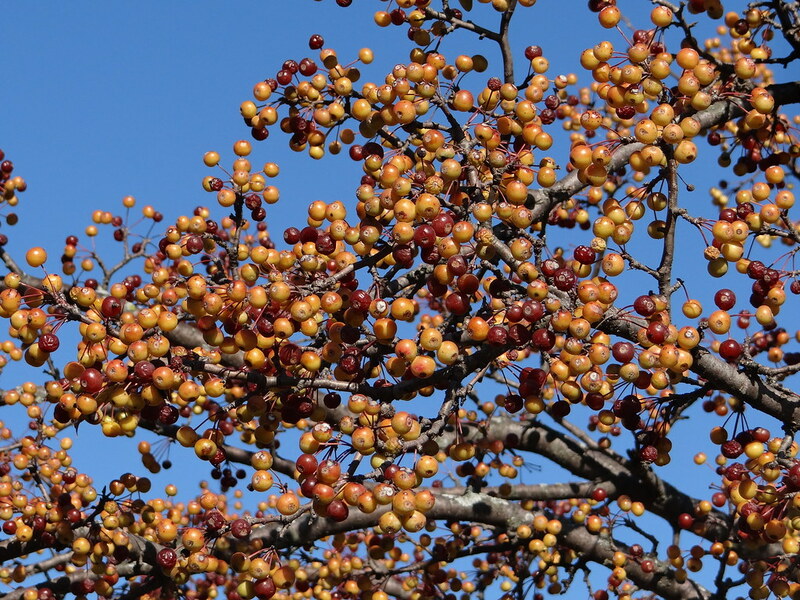 The color of the yellow crabapples holds until eaten by birds or a severe freeze (colder than 10F) makes them turn bronze. 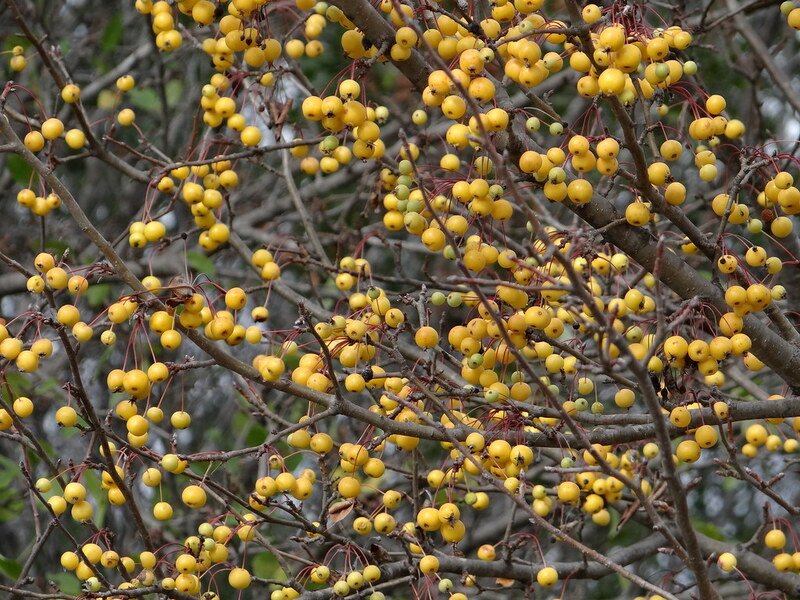 Look for Harvest Gold Crabapples on the east (Meadow) side of the Island Garden. Here's a 'Sugar Tyme' crabapple on the edge of the Perennial Garden. It has very nice fruit set too and stays a smaller tree -- what most nurseries are going for now. When selecting a crabapple I always start with learning if it is a disease resistant variety (all described above are very disease resistant here). Secondly I look at its mature size (most grow taller than wide). Thirdly I pick them for their fruit display and I pick them last for their flowers! 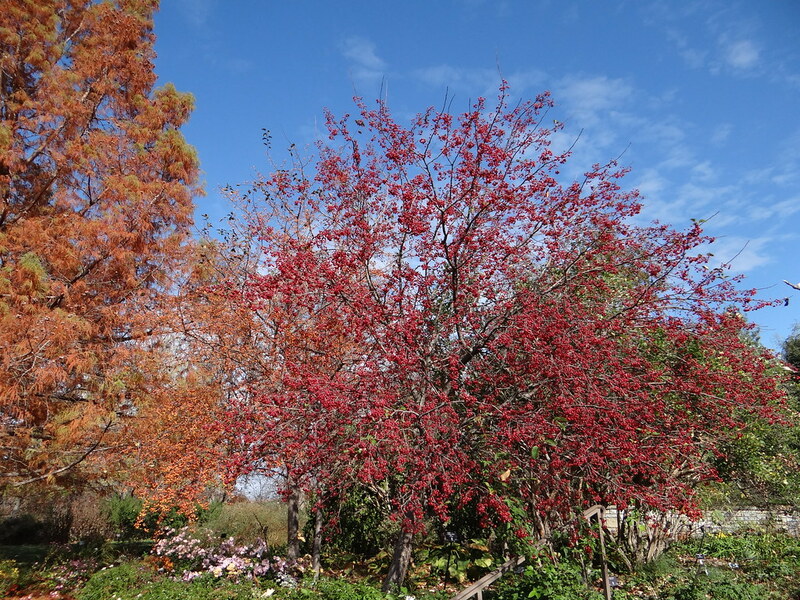 Ornamental crabapples are phenomenal plants for wildlife friendly gardens. Their fruit is a staple of many fall and winter birds. They are also host to many beneficial insects and unlike most non-native plants, our native insects readily transfer from our disease-prone native crabapples to these more garden ornamental varieties. 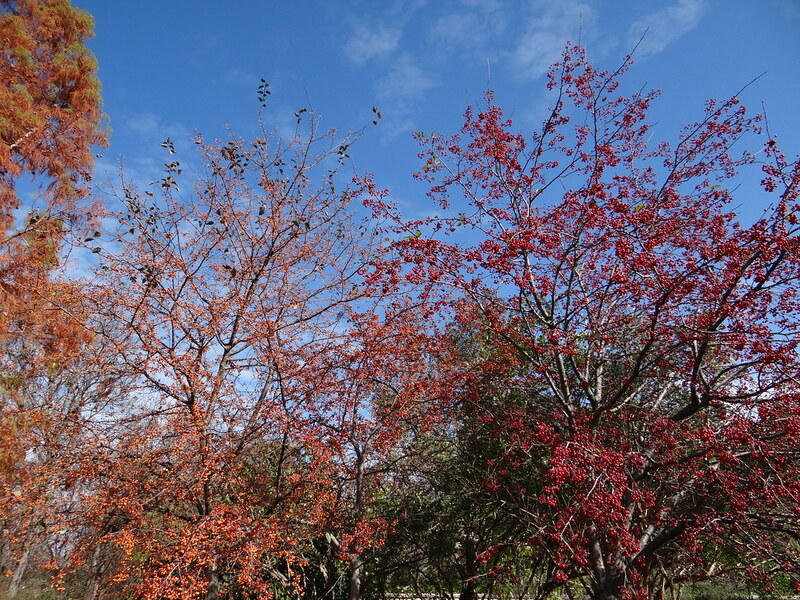 Crabapples are also NOT invasive like ornamental pear trees in our region. 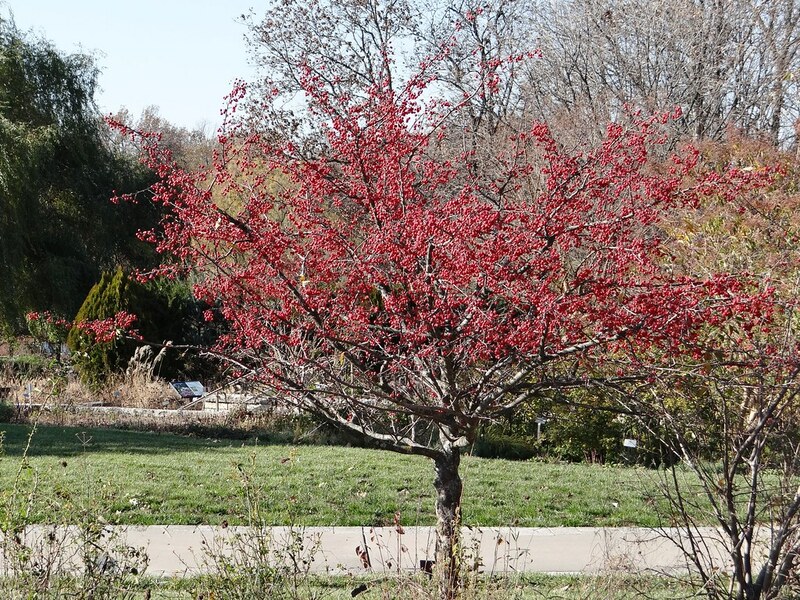 The Washington Hawthorns (Crateagus phaenopyrum) are also beautiful at Powell Gardens right now as the leafless trees are completely cloaked in red fruit. The dry year helped them out as they can be very disfigured by cedar-quince rust disease -- a reason we no longer recommend them. Look for them by our trial beds near the old visitor center. Hawthorns are a beautiful and important part of our native flora so we do have them in the wilder parts of the garden including 3 native species along the Nature Trail: Frosted Hawthorn (Crataegus pruinosa), Red or Downy Hawthorn (C. mollis) and Cockspur Hawthorn (C. crus-gallii). The blazing red shrubs in the above image are 'Sparkleberry' Hollies (Ilex serrata) in fruit in the Perennial Garden. Behind them are Shumard Oaks (Quercus shumardii) which are very late in their fall color -- some Shumard Oaks usually have no fall color while others can be a nice red. So there is still much beauty in the late fall garden, most specifically the brilliant fruit of fall-fruiting plants.